This site is an online store that offers apparel and also the chance for you to design your own customized apparel. In this site you can find all the information you need to know about the site itself and the products and services they provide. In the Shop section this site offers apparel for men, women and kids. They also offer printable products, transfer papers, heat transfer presses, software and art packs and iron-on lettering and tye-dye kits. Apart from this, you can look in the promotions and discounts list to find special prices and offers. In the Hans T-Shirt Maker you can find all the information you need to know about how you can do to create your own designs and how to print these on your apparel. You can also find thousands of designs to choose from and much more information on templates based designs, quality clip art, hundreds of text effect, backdrops and borders, photo effects and filters, custom color picker, imports your images and mirror image printing. 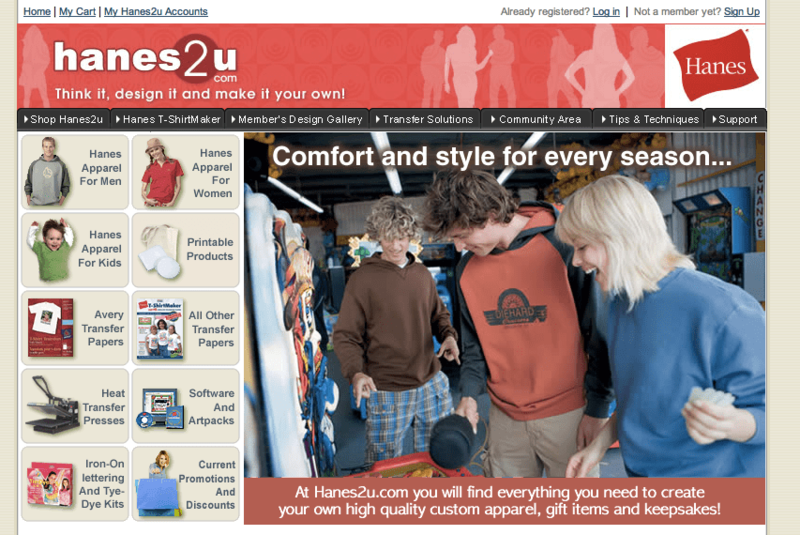 You can order the Hanes T-Shirt Maker online from this site as well.